A rare marine feature wrecked by a dredging boat has been identified as the biggest known reef of its kind. 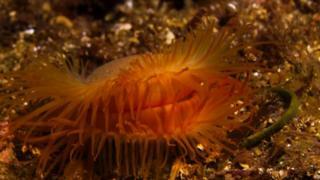 Divers have estimated that about 250 million flame shells exist on the bed of Loch Carron in Wester Ross. Ministers will now seek to make the emergency measures put in place to protect the reef permanent. In April, a scallop dredger dragged its gear through the reef on two occasions causing damage from which it is likely to take decades to recover. Fishing on Loch Carron was immediately banned and divers have been assessing the size of the reef. They have discovered it is two-and-a-half times larger than a similar feature in Loch Alsh, previously thought to be the biggest. Fishermen have urged caution on the widespread use of Marine Protected Areas (MPAs) which prevent them operating in sensitive areas. Environment Secretary Roseanna Cunningham said: "This is an astonishing find and I think that we would be completely remiss not to take notice of it and to do what we can to protect it. "The measures that get put in place for MPAs we put in place in consultation with the fishermen to make sure they are reasonable and appropriate." Dredging involves towing gear across the seabed to scrape-up the scallops which live there. They can also be caught in smaller numbers by divers. The dredger which damaged the Loch Carron reef was operating legally because no protection measures existed at the time. Nick Underdown, from Open Seas, said: "Flame shells are highly sensitive to damaging fishing activities like scallop dredging and prawn trawling. It just does not make sense to tow across these fragile habitats." Fishermen's groups have distanced themselves from the skipper's actions, saying he did not belong to any industry organisation. Bertie Armstrong, from the Scottish Fishermen's Federation (SFF), said: "The Scottish Fishermen's Federation is foursquare behind environmental protection. We are working closely with Marine Scotland on the identification, designation and management measures for the MPA network seeking a balance with sustainable economic activity. "Flame shells are already covered by a number of representative areas. Inclusion of additional examples of any feature will always be considered carefully, again taking due account of all the needs of fishing communities. "SFF member associations have no objection to formalising the emergency provisions for the Loch Carron flame shell bed." Scottish Natural Heritage (SNH) has conducted a series of dives at the site to establish the extent of the damage and the size of the reef. The vibrant red flame shells are not normally visible as they live a few centimetres into the sand. Their beds are nursery grounds for young scallops. After the dredger had crossed the reef, flame shells were uprooted and scattered across the loch. Ben James, from SNH, said: "They used to be much more widely distributed and the habitat, whilst it's a firm mesh if you like, it's like fabric and it's very sensitive and easily ripped and torn apart. "They sort of ripped the beds up and all the flame shells were exposed, and once they're exposed the flame shells die."